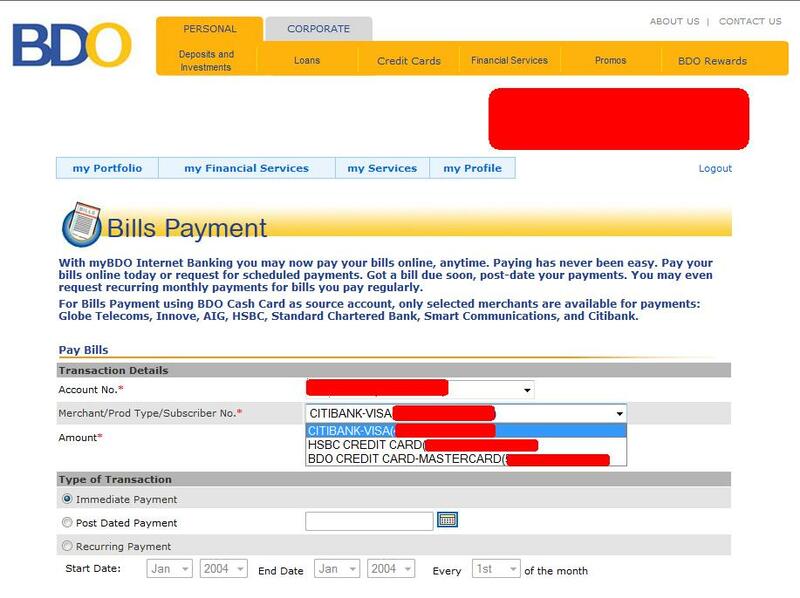 ruthdelacruz | Travel and Lifestyle Blog : [Updated 2018] BDO Online Banking: How to Pay Your Credit Card Bills Online? 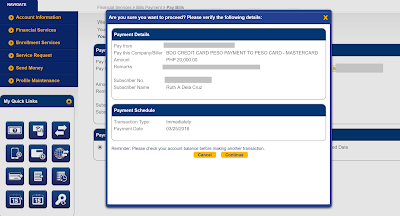 [Updated 2018] BDO Online Banking: How to Pay Your Credit Card Bills Online? I am updating this post to show the updated web version of the online banking site as I see a lot of hits for this post. Just to make it more useful for the readers - updated on 4/25/2012 March 25, 2016. I received a note last week from our HR team advising us that BDO would be doing system upgrade this Holy Week - which means, we wouldn't be able to transact through ATM (no withdrawals), and even access the BDO online banking. I was able to talk to our neighbor who works in BDO and asked if the system is already up today, and yes it is! 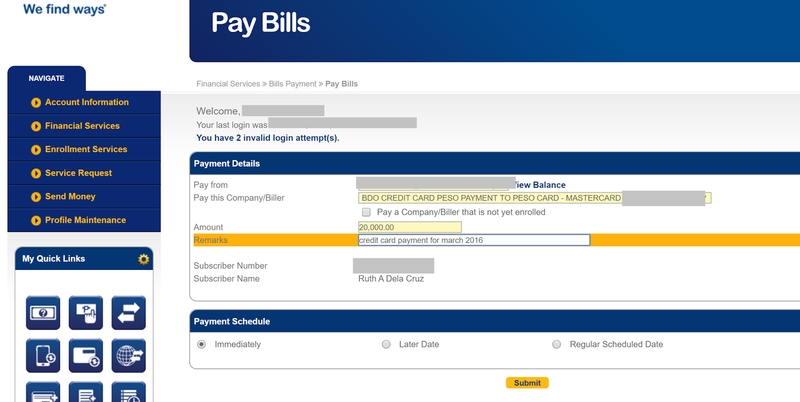 I was worried about my credit card bills, so I logged in at www.bdo.com.ph to pay my BDO credit card bill. I love online banking as it saves me time. I hate any place which requires me to fall in line - government offices, NBI, and banks. 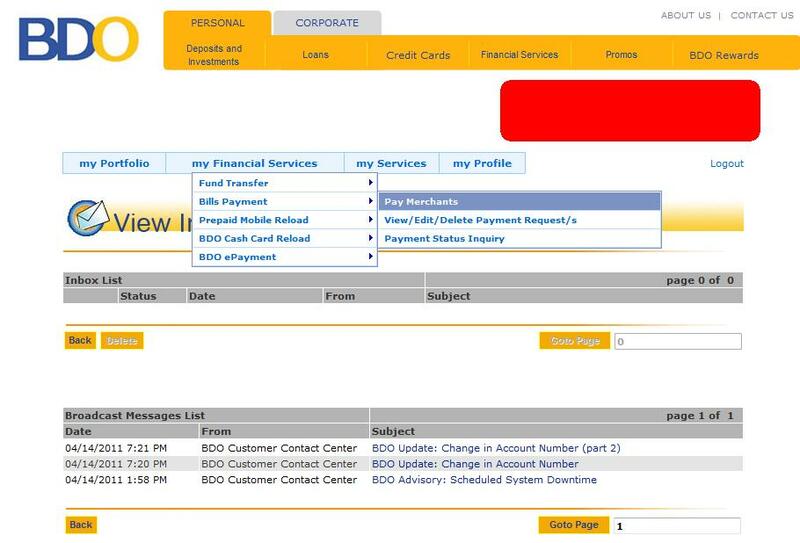 When I opened another bank account with BDO, I asked the teller how I can enroll in the online banking. 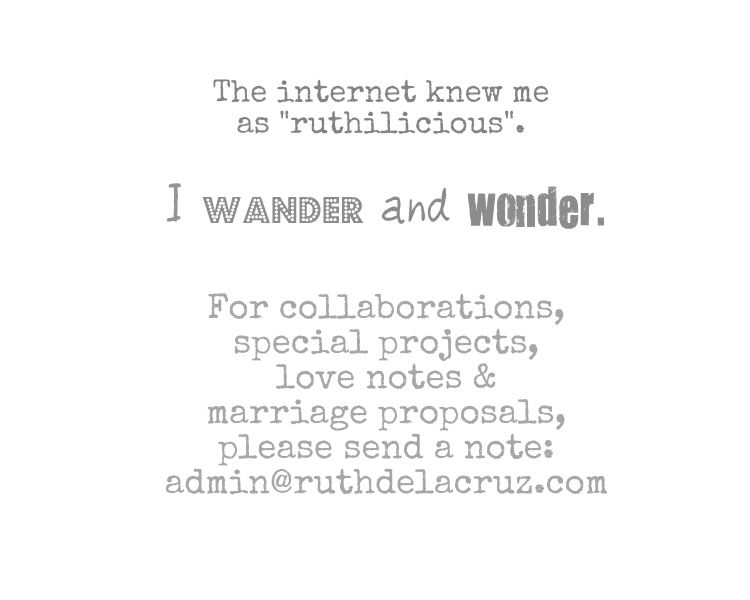 She gratefully entertained my request and registered me online. I just filled out and signed a document. For those who want to enroll, you may apply online and fill out the form. Then print it and go to your nearest BDO branch to have this validated. 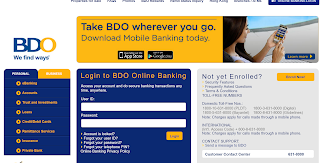 What do I do with BDO online banking? Transfer fund from my payroll account to savings - this is safer and more convenient than withdrawing money from the bank and depositing to another savings account. 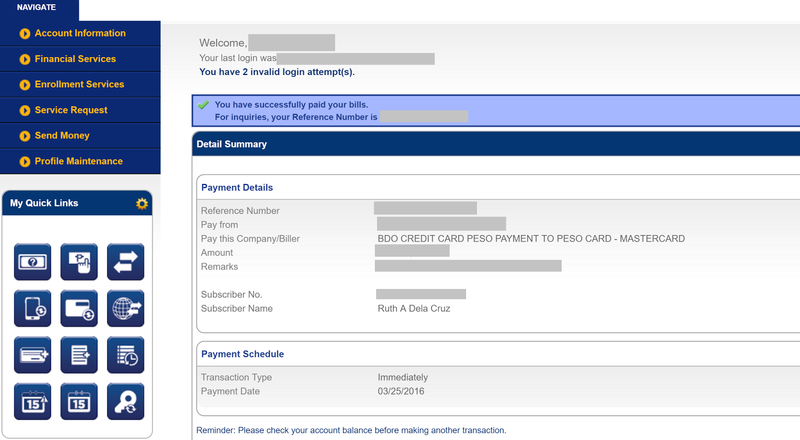 As soon as the BDO online bank account was activated, I have added my payroll account and credit cards. You may also have the option to pay your other bills like electricity, phone, water, etc (I just didn't add the accounts because those were not named under me). How to pay for your credit card bill online? 2. Once logged in, click the Pay Bills icon. 3. A new window will load. Select the source of fund from the drop down menu. Select the enrolled credit card from the list. Please note that I have also enrolled utility accounts which allows me to pay them online. 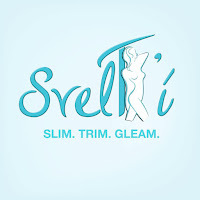 I have added my credit card accounts online so I can all pay them online. The subscriber number is your BDO Credit Card. 5. Enter the amount in the field. You may also make a comment just for your own tracking. See that there is also a way to view the balance of the source fund you selected to ensure you have enough money in that account to pay for the bill. 6. 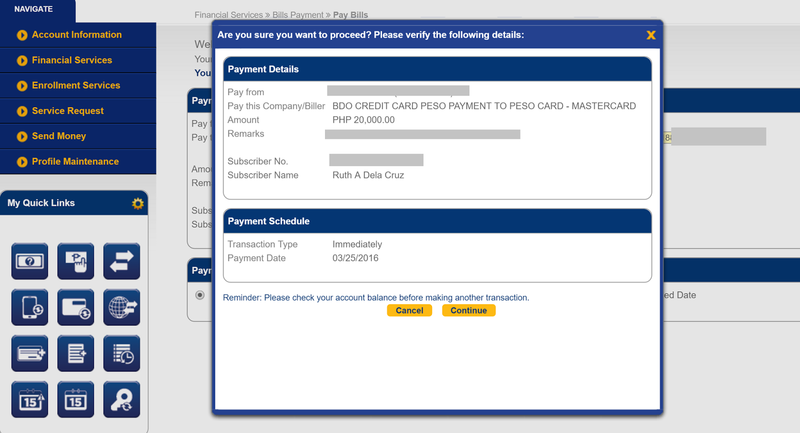 Upon clicking the Next button, you would be routed to a page which would show the summary of your payment details. Click Confirm to continue. 7. 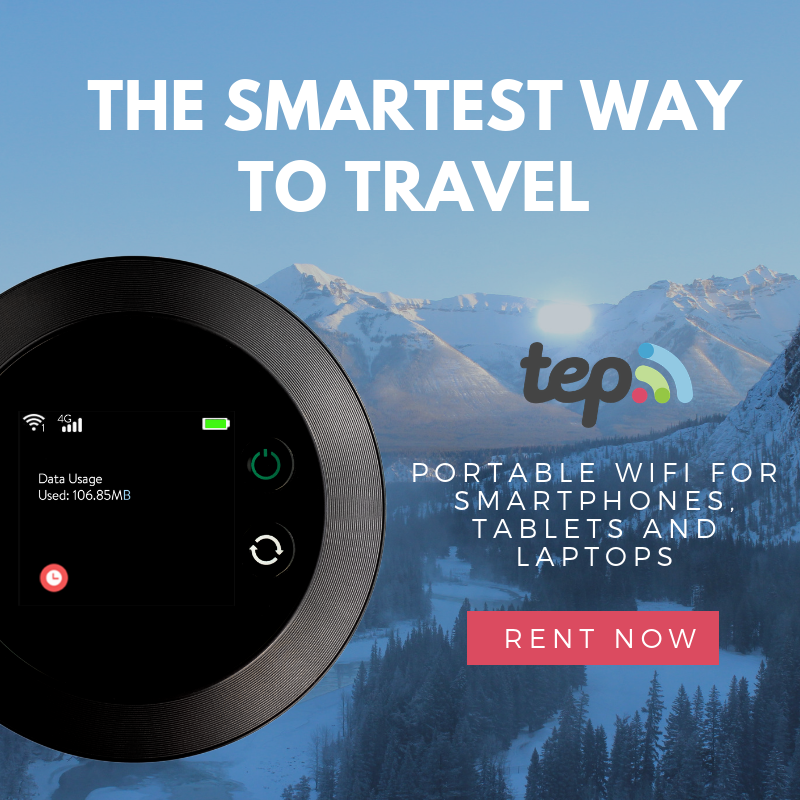 After every transaction (fund transfer, loading, bills payment), you would receive confirmation on the screen and an email confirmation in your inbox (registered email) would be sent to your inbox. If you are the type who doesn't remember the payment due dates for your bills, you may schedule a recurring payment option where the system would automatically pay your credit card/merchant bills. 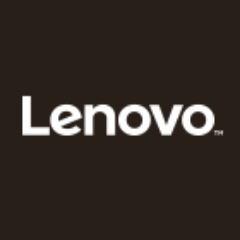 Store financial details, backup sensitive data & access encrypted virtual desktops from your preferred mobile devices with 99.9% uptime guarantee from CloudDesktopOnline, Now you can also access your complete MS office suite on the same desktop by visiting www.O365CloudExperts.com with 24*7 dedicated support from Apps4Rent. Easy, right? Only took me 5 minutes or less to settle the bill. Saves me the transpo and an hour of going to the bank to pay my bills. The wonders of technology! Now I'll use the hour I have saved to do the laundry! If you like this post, please subscribe to my blog or like my Facebook Fan Page at www.facebook.com/ruthiliciousblog. 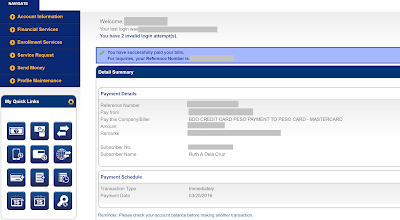 © ruthdelacruz | Travel and Lifestyle Blog : [Updated 2018] BDO Online Banking: How to Pay Your Credit Card Bills Online?